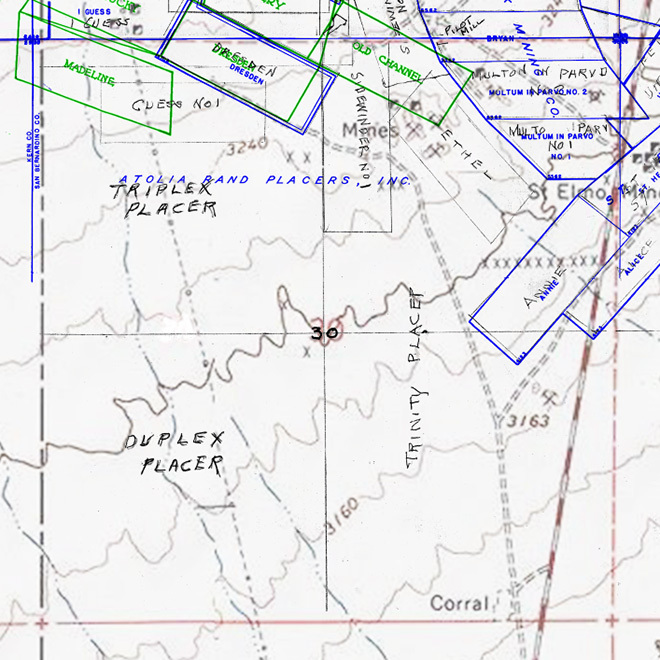 GREEN boundaries and names are those shown by Hulin, 1925. 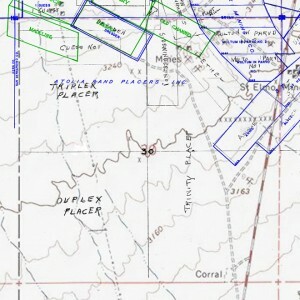 BLACK pencil hand written names & boundaries are those of an anonymous benefactor, assumed to record the real estate of affairs at a subsequent date to 1940, which map (BLUE) was used as template. The original was drawn on a micro-fine thread textile drafting velum, of the highest quality; delicious to moths & rodents. The name: “J. K. Wadley” appears in Section FS-18, not associated with any particular claims, is the best candidate for author. Where claims straddle two Sections, we’ve put the text in the Section using up the most territory. For the purposes of organizing the mountain of information in the museum collection, we’ve created the Claims Category as a repository for the zillions of locations which ‘didn’t pan out’ or whose economic ore had played out before 1940, or whose production didn’t attract much, if any, media interest. Particularly in the beginning, many properties came under the classification of ‘Paper Claims’, held on the merest hint of value, or merely by virtue of their proximity to known producers, (and possible promotional and/or nuisance value). Indeed, parcels barely large enough for an out-house produced fabulous wealth, but they were the exception, and all are remembered here. Mark Twain defined a Mine as “a hole in the ground owned by a liar.” Where the holes are deep enough we’ve probably given it a feature article at: Atolia>Mines. This entry was posted in Atolia, Atolia Claims. Bookmark the permalink.